I hope your joking ! We are about to try and negotiate another, same as mine ( different colour, maybe Brilliant Blue with ventilated seats and no running board) to replace the Lexus ......" Mother Bear" will be "Not happy Jan ". If that's the case. The GLC has sold beyond MB's initial expectations hence the price rise, lack of stock and therefore discounting. Techno it appears that this is a common problem on Oz delivered GLC's. Mine comes up with the same incorrect diagram. The battery location in Penn's diagram (post 25) is perhaps an illustration for left hand drive vehicles. 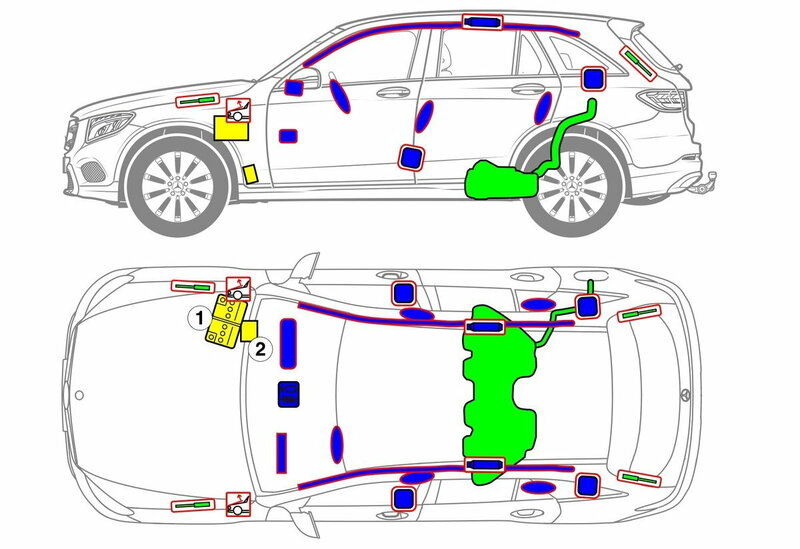 I just looked at my GLC and the battery location is as shown in the diagram. After closer examination of the diagram am convinced it concerns a left hand drive. Although there is no key explaining the various components it appears the drivers airbag is on the left side. Agree, this misinformation could be considered a critical error for first responders. M-B should issue a supplement to the manual correcting the issue. Last edited by larrypmyers; 06-14-2016 at 09:15 AM. Some good news for Oz owners of GLC's with 20" wheels. Tyres have dropped in price from approx $600 each in December to $470 for Continental run flats. Conti are currently running a 4 for the price of 3 promotion ie 352.50 per tyre if purchasing 4 tyres. Hopefully the price will keep dropping as the size becomes more common and before we all start requiring replacements. MOE Pirelli that came with the car. So far happy with tyre wear, though concerned front end alig might be out with "feathering" to outside edge of tyre on passenger front. I am buying a digital tyre depth measure to check tyre wear on all 4 tyres. I will check new depth and compare to mine, I've travelled around 9000km to date, rear tires look brand new still. The "feathering" was also an issue with my previous ML's. Solution was to rotate tyres front to back every 10,000 km to even out the wear. Shame MB do not provide a jack and wheel brace so I could do it myself. Looks like I need to book it into MB. I would prefer to get a front wheel align as the wear pattern on the front left looks quite aggressive, compared to the other 3 tyres. Thanks again, agree rotation is the way to go. Cheers. Found on another site in Oz? looks like Bridgstone are also a contender. Interesting submission by MB OZ to Federal Govt on "Grey imports" of Mercedes into Oz. Some comparisons of differences between UK and Aus cars that look the same, but have different build states. The first point on Page 2 about the cooling system is the issue many private importers forget about. The Oz bound MB vehicles generally have the same upgraded cooling system and electrical system as supplied on the middle east vehicles. The cooling system on a UK import would be marginal in a Aussie heatwave. i have been using runflats for about 10 years now and have found entry level Contis good but low mileage, SPMaxx bad, and Pirellis best with PZero less mileage but more grip than P7. All do 34000 for me except P7 which do 45000 ..all experience on A4 and X3. 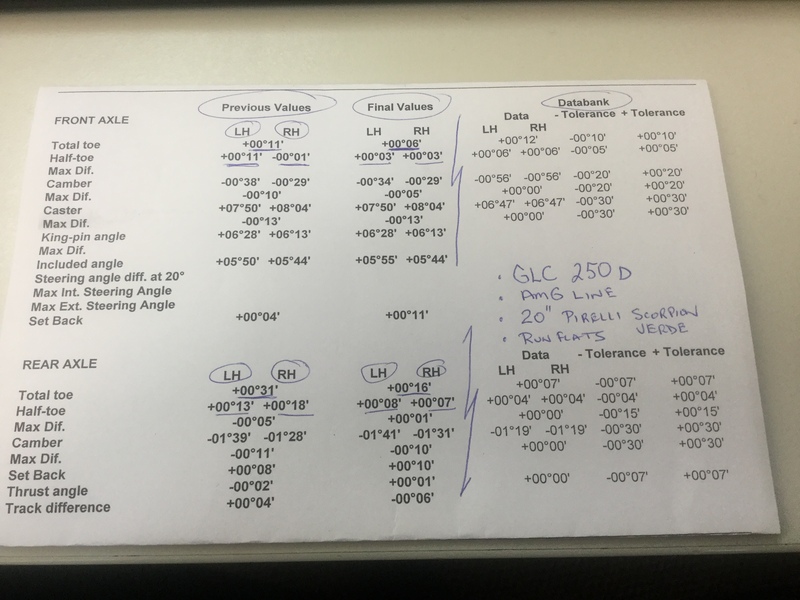 My GLC will have 20s so glad to read this. Heated rear seats and steering wheel are an option in the UK but not heard of the spare wheel option? Where have you found the heated rear seat option in UK ? I'd like it - its available in Germany though, but I thought not in UK. Cooled front seats available in Germany too !! Codes E76 or 690 get you the spare wheel. Just had front end alignment $250. Looking at data, I'm not sure if they were checked pre delivery, given rears also out. I'm not a mechanic so unsure if prior data was just out a little or a lot ? Hope this hepls you with OEM Database figures. Incorrect toe settings will cause feathered tyre wear so the alignment explains your feathering issues. Was the alignment done by the stealership? I paid $60 for a 4 wheel alignment on a W204 C Class 2 weeks ago. Approx what discount of RRP did you receive, or " free bees" in lieu of "discount", as MB do not like the word discount in vocabulary. Any feedback on delivery times; example deposit now, build in Sept and delivery to Oz end Nov. ? The best option in lieu of a discount is membership of the corporate program which gives you free servicing for 3 years. GLC Coupe prices revealed for Aussie release in DEC 2017. AMG versions in 2017 as well. Hi, anyone in Oz who does not have running boards, or had them fitted later after delivery ? Looking to remove ours and fit smooth line to GLC. Any seen on eBay ? Found this video comparison of GLC. British, UK. To Aussie viewers, Episode 2 of new Top Gear, on Channel 9, Go channel last Mon ni. Test,,,,, not really, just a drive in Sth Africa of GLC, Porche and new Jag F - type. Not a real comparison but an insight. If so what likely costs, or if not do they act as agents for third party providers like QBE, Alliance, etc. Trying to avoid reading GLC manual. Does anyone know how to activate the glove box light when opening it ? Mine stays off, opened it tonight, dark outside, engine off, cabin light came on, no glove box light. Well, I have decided to get paint protection. In the past I have prepared my own cars and applied two part paint protection, called Amazing Glaze. Aust sellers seemed to have gone, still agent in Singapore, have been very happy with results. For the GLC I have " bit the bullet", so to speak and engaged a prof detailer in Melb to apply "Concours" Nova and Si product. Means I will loose the car for 3-4 days while it cures and hardens, but I believe it will be more than worth it. Time will tell ! To save the interior trim I will get that treated with something, to stop all the hand cream and makeup from the ladies in the house leaving all their hand marks over everything and staining , very hard to remove currently, again will see how effective interior treatment is. Happy to report back after weekend.